Preventative maintenance is defined as maintenance which is carried out to prevent an item failing or wearing out by providing systematic inspection, detection and prevention of developing failure. Everything that we own is bound to wear out and to deteriorate over the course of time. In construction the roof is by far the most susceptible to failure if not properly and regularly maintained. Regular inspection and repair to areas of the roof that require regular maintenance is necessary to avoid premature failure of your roofing system and other unnecessary repairs. Areas of the roof that typically need repairs and maintenance include but are not limited to drains, pitch-pockets, perimeter metal coping joints, field seams, transition areas and many others. Vanguard Roof Management is built around the idea that the best way to meet the customers’ goal of driving out unnecessary costs and eliminating waste is to proactively manage roofing assets. 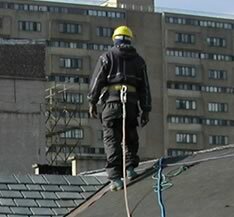 The key element of roof management is having professionals inspect those assets on a regular basis. Please feel free to contact us should you be interested in getting a free estimate for our different options available for PPMA.